I haven’t the right to either excuse or judge Pat Robertson. He’s an imperfect man just like me. And the Bible explains that “If we could control our tongues we would be perfect and could also control ourselves in every other way.” (James 3:2) But the fact that Pat is in the frightful position of having a microphone plugged into a worldwide television network presents a problem. And it makes me want to clarify that Reverend Robertson doesn’t represent the hearts of most Christians I know. This is not a time for sermonizing and theorizing about judgment. It’s a time for grieving, giving, and prayer. On the morning after the quake I found myself in a roomful of young people crying out to God on behalf of the Haitians and looking for ways to help. That’s the kingdom response. This past week in Denver was amazing. It was one of the most responsive groups of students ever, and I fully expect them to change the world. Next time I write I’ll do my best to follow through on that study of the “missing pieces.” In the meantime lets keep our hearts, hands, and wallets open towards the Haitian people and our prayers covering their suffering and loss. 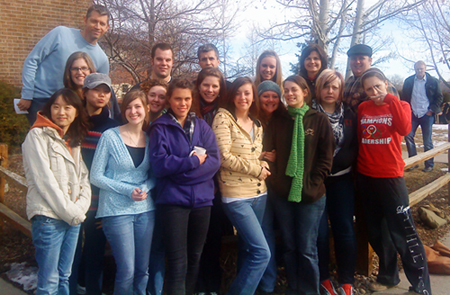 This week’s Discipleship Training School students in Denver. PS: Just a note to mention that CBN has issued a statement reminding us that Pat Robertson did not attribute the quake to God’s judgment, (as some critics have evidently charged), and that the humanitarian arm of CBN has been on the scene since the day after the quake with volunteers and millions of dollars worth of aid and medicine. I like your message, we all need more of God’s love and compassion in our hearts, eliminating judgement, it’s not our job! Bro, you were awesome here! Thanks for being here!